The Bottom Whine is the one safe place you can go to to whine to your heart's content -- and to listen to others whine. From bra straps to manufacturers' labels and tags that scratch your skin off... to people who perpetually smile (and can't be trusted), there's always something to whine about. Join me for a whining good time! 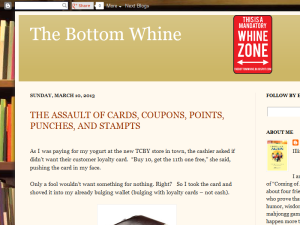 This what your The Bottom Whine Blog Ad will look like to visitors! Of course you will want to use keywords and ad targeting to get the most out of your ad campaign! So purchase an ad space today before there all gone! If you are the owner of The Bottom Whine, or someone who enjoys this blog why not upgrade it to a Featured Listing or Permanent Listing?